A gentle eel that gets to about 3-4 feet long. 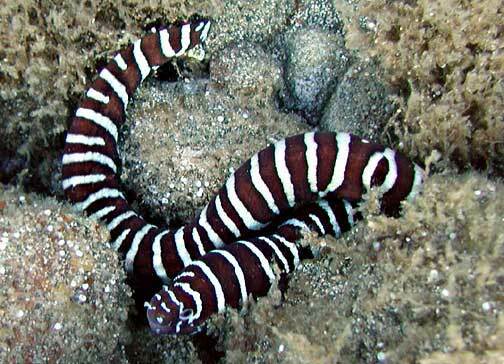 People have kept them in reef tanks but they will eat invertebrates and clams, so they’re very risky in a reef tank. They also put out a tremendous amount of waste, which puts a big load on your system. They are pretty much blind and move around the tank very clumsily, knocking over corals and rocks. They need rocks or PVC pipes to hide in. Though they don’t have the sharp teeth that most other eels have, they’re more like pliers and they should still be fed with a feeding stick. They can be housed with aggressive and non-aggressive fish without any problems, though they shouldn’t be housed with aggressive triggers. Some can take a while to get to eat, so may want to try mackerel or soak some food in mackerel oil to get them started.